If the idea of cloth diaper folding and then, choosing a cloth diaper cover, is a bit more than you want to bite off and chew, you should consider the All In One Diaper. Not only will they streamline your cloth diapering system, but because All In Ones are like a fitted diaper and diaper cover sewn into one easy to use cloth diaper, the use is much like a disposable diaper, you just don't toss it after you change it. In the photo instruction below, we will use a bumGenius! Deluxe All In One Diaper, but the same principle applies to all the AIOs we offer. Though most parents find that all in one diapers are obvious in the way they are to be put on baby, we have provided a step-by-step example below of how to put on a bumGenius! Deluxe All In One Diaper. just in case. Overall, you will find that all in one diapers have the advantage of being quicker, and easier to pack for trips around and about, as well as for daycare providers, caregivers, dads, or whoever may be caring after your child. All In One Diapers are easy to put on baby! 1. 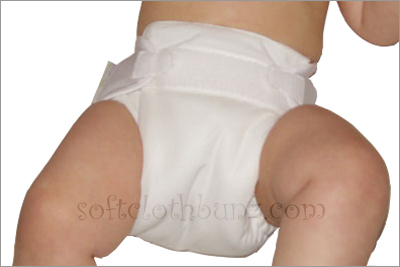 Grab your All In One diaper, here we use the bumGenius! 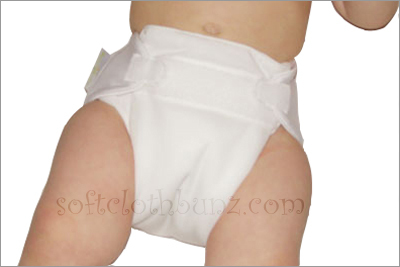 Deluxe All In One Diaper, and lay it flat on the surface in front of you with the stretchy tabs layed-out side to side at the top. 2. Lay baby atop the open bumGenius! 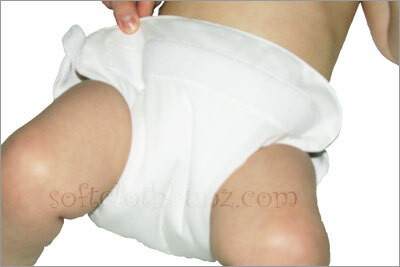 AIO with the back edge of the AIO level with his/her waistline and draw the front part of the cloth diaper up through the legs to the front waistline. 3. Grabbing one of the back stretchy tabs, pull it forward and around baby's waist to secure with velcro to the front panel. Because of the stretchy tabs and the velcro, the fit is highly adjustable. 4. At times you may need to loosen or tighten the tabs in order to get that perfect fit. Remember that baby is laying down at this point. If your baby is of sitting age, then you'll need to allow a bit of "give" for when he/she is in he sitting position. Many parents like to secure diapers very tight to avoid leakage, but this will cause red marks at baby's waist and be difficult for baby to have comfort when mobile. 5. Repeat this process for the other side. 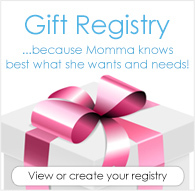 Most of the time you will need to disattach and adjust according to what is comfortable for your baby. Believe it or not, that's it!. Cloth diapers do not have to be difficult. As you can see from this demonstration, just about anyone can assist in cloth diapering your child when you use bumGenius All In Ones. Now that you've learned how to put on an All In One diaper, you'll find that the same process is used with fitted cloth diapers. The only difference is that fitted cloth diapers require a diaper cover, as they do not have a waterproof outer fabric to keep in moisture. If you have any questions whatsoever, please do us the favor of letting us know, we'll be glad to help you find the right cloth diapering system for you and your baby.